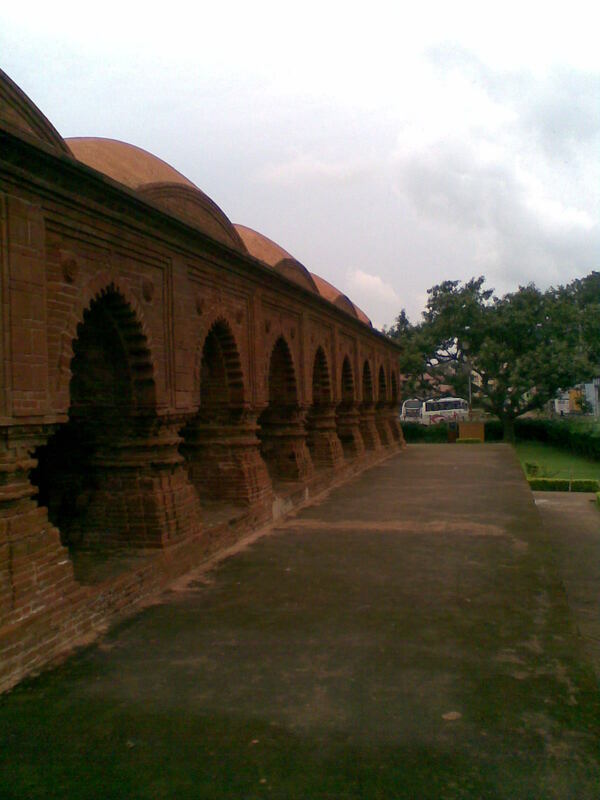 Bishnupur 150 km west of Kolkata (Calcutta), just beside Ramsagar, was the capital of the Mallabhumi dynasty. Bishnupur, formerly known as Malla Bhum, is famously known as the temple town of West Bengal for its architecturally exclusive temples. They ruled over a small region from 697 AD until the 8th century. 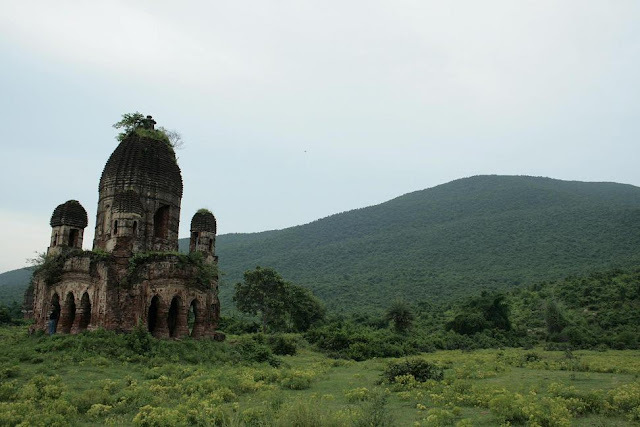 In the 16th century they expanded and became powerful during the reign of King Birhan Bir.His fort is almost gone, but he developed the city with many lakes(called Bandh in Bishnupur like Tal in Kumaon) and ponds in true Bengali style. Simultaneously during the Hindu revival, Chaitanya preached his faith and many temples were built as a result. 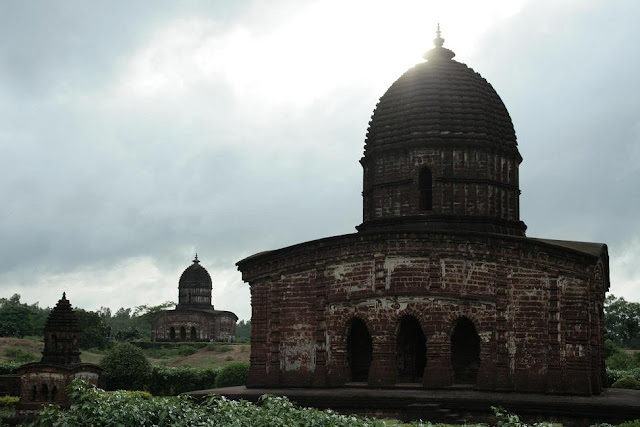 There are 30 temples (17th-18th century) in Bishnupur that are a treasure-trove of terracotta sculptures. Krishna, an incarnation of Vishnu and his love Radha, are detified in most of these temples. 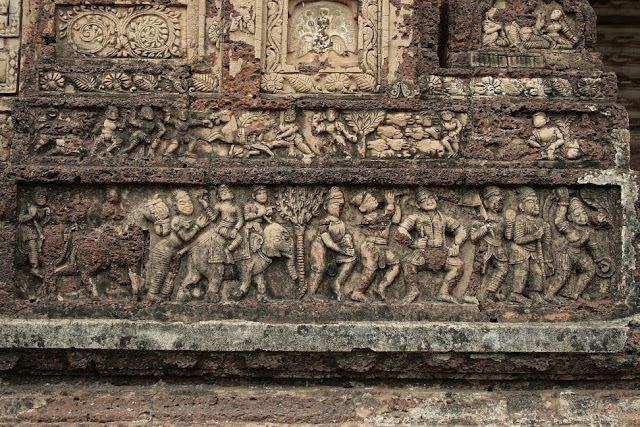 The Mallabhumi dynasty also had cordial relations with the Shaivites. In the 17th century they fought the Marathas and in 1806, the East India Company took over, gave control to zamindars (local chieftains) and Bishnupur faded into oblivion. We took a rickshaw (Rs 20) to reach our hotel Paryatan Abash (Bishnupur Tourist complex ; 03244 -252200) and rented a double bed room for Rs 130. 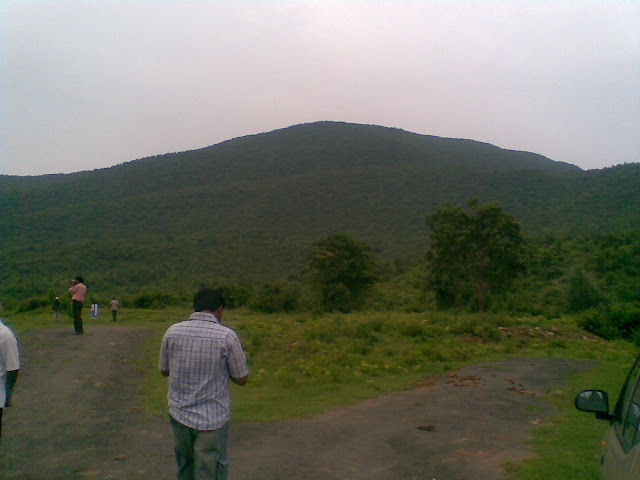 It is 1.5 minutes walk from most famous WBTDC tourist lodge . One can also stay at Heritage Hotel (with AC): 03244-254 298 & 9434 160 193. There we met freelance TV journalist Sushanta Nandy (9233 211 572) , who normally works for 24 ghanta channel.He was of great help to us. He is a local guy. He insisted that we should stay back to see Jhapan festival. Then we took a city tour by hiring a cycle rickshaw (Rs 200 for 4 hours).The name of the rickshaw puller is Kalu Das (His brother's name is Bibek Das - mobile 9932 85 1256). He is quite nice. Kalu Das in front of our hotel. I think it is the best way to navigate the lanes and by lanes of Bishnupur. 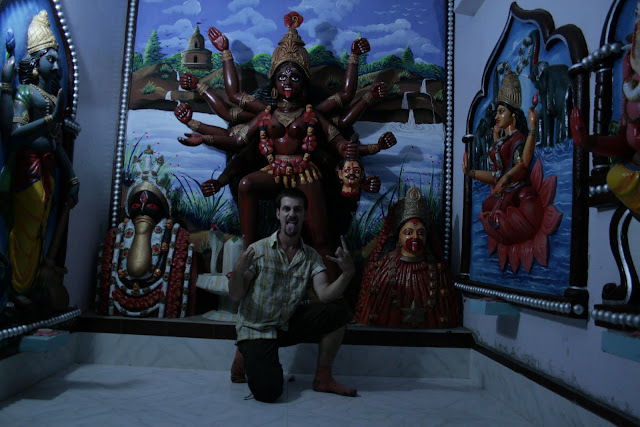 At one of the by lanes of Bishnupur we saw an interesting sculpture of Kali.We also a devotee of Kali. I must say it is much much better than what I thought. The terracotta of Bishnupur is simply mind-blowing. It is difficult to understand why it is not a major tourist attraction. We started from Rash Mancha, focal point of Bishnupur, very near(1 minute) to our hotel and 3 minutes walk from WBTDC Tourism lodge. 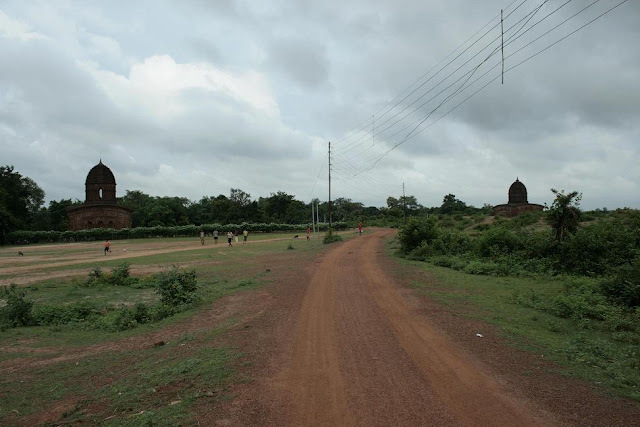 On the southern outskirts are temples made of Laterite and not brick. Laterite, which is red clay, is also called red earth. Since it is a hard stone it can be used for construction. However, it is coarse in appearance and hence is usually finished with stucco. Since it is much cheaper than stones, it is used for foundations, platforms and even walls of buildings. The sculpting on stucco is generally of a very poor quality and it wears off after some time. 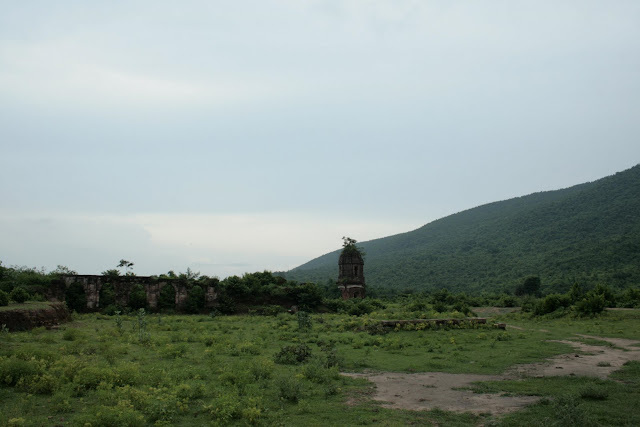 Unlike the temples and monuments , found elsewhere in India , built out of marble and stones brought from far-off places, the basic construction material for the Bishnupur temples was the local red soil. Out of the red clay, terracotta tiles were made. On the tiles, scenes from the the immortal Hindu epics like the the Ramayana and the Mahabharata were artistically depicted. The distinctive feature of the of the Bishnupur temples is that in their structural design, they resemble the local huts. 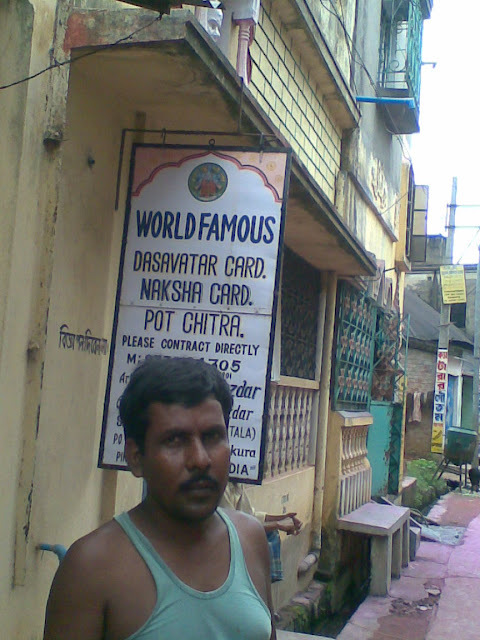 Then we met Sital Fouzdar (Mobile 9732 08 34 28) , 87th generation of Fouzdar family who makes playing cards (Ganjifa card) based on 10 avtars or incarnation of Vishnu (10 X 12=120). It is played with 120 cards. 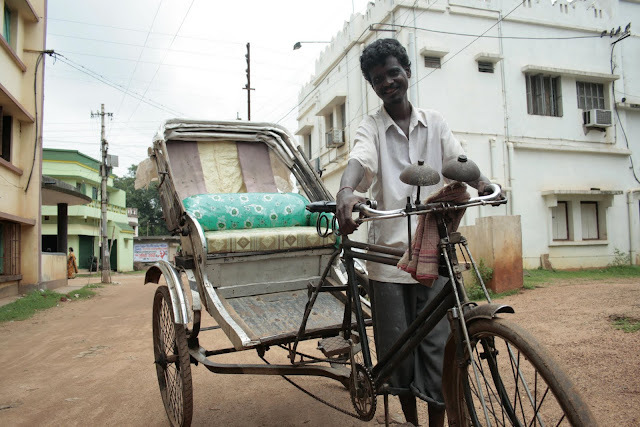 Thanks to Kalu Das, our rickshaw puller, we were able to visit that place near Sakhari Bazar. The cards are hand painted (made of vegetable colour) . Each cards costs Rs 50 . I bought one from him to honour his craftsmanship. He explained how he learnt the game from the descendants of Royal families (who were reluctant to teach him) with the help of a German lady(who stayed in Bishnupur for 3 months and paid Rs 1000 to the descendants of Royal family every day to learn the game !!). These type of cards are made only by five families in Mysore, Jaipur, Orissa (Raghurajpur) and Bishnupur. Sital Fouzdar took almost an hour to explain all to us. Bishnupur is also famous for exquisite Baluchari Saris , generallly priced above Rs 2000. 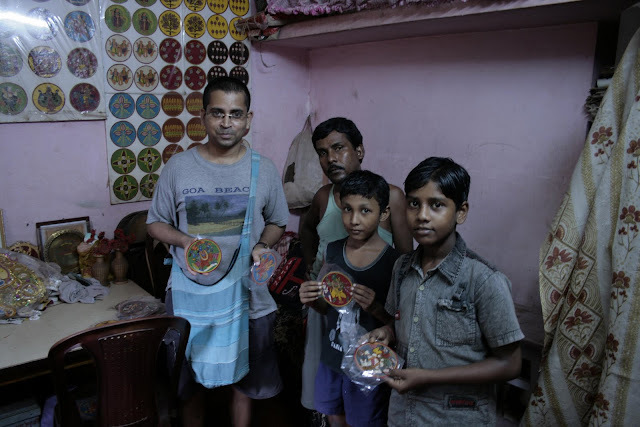 In the evening we purchased mementos/souveniers from a decrepit shop "Karu Kala" owned by an old man,Prafulla Pandit, 100 metres from Chinnamasta temple . He is selling at an unbelieveable price (you cannot get anything cheaper) and also very courteous and extrememly honest ( I mistakenly asked the price of an item " Is it Rs 5?". He said " it is Rs 3" !). Please do not go to his son's (Raja Pandit) shop , 90 metres before his shop. Phone no. of his son (Mobile 9474 04 83 03).Pierre became mad after seeing the price of items and was thinking of shipping a 50 Kg elelphnat (Rs 100/-) to France. I could restrain him only because of transportation cost which will be quite cheap, 20 times the price!!! . We purchased the horse and elephant , among others, which is the hallmark of Bishnupur craftmanship. 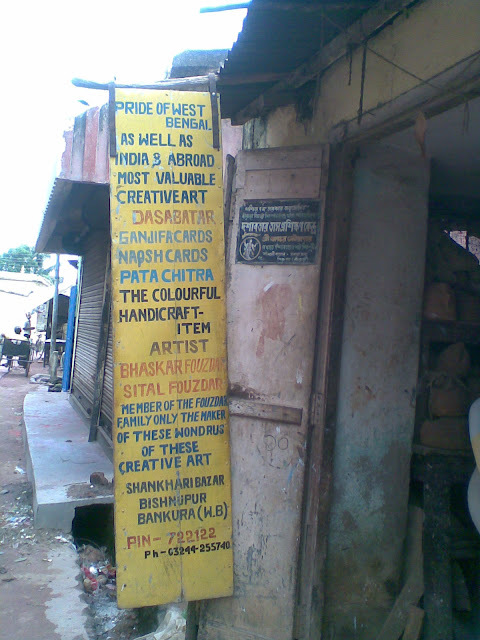 Bisnupur school of music ( Bishnupur Gharana) is also world famous. Unfortunately we cannot go to the place where the musicians stay near Sakhari Bazar. The most famous musicians are Jadu Bhatta,Radhika Mohan Moitra (Sarod), Manilal Nag(sitar) and daughter of M Nag, Mita Nag. Interestingly we saw a live programme of Mita Nag at Calcutta school of music on 14 th August 2009 and even talked to her about next days trip to Bishnupur ! The only place in whole of India, where you will find terracotta artefacts like Bishnupur horse and world famous temples, famous Baluchari & Swarnachari sarees, Conch shell carving, its own classical musical school or gharana, Dokra and Dashavatar cards - all in one place - believe it or not ! 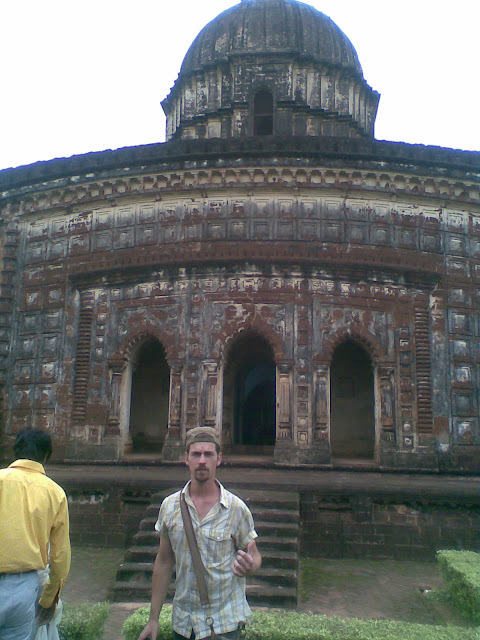 On 16/8/09 we went to Garh Panchakot (rather Panchet- nobody seems to know Garh Panchakot at Bishnupur). First we went to Bankura by bus (Rs 20) at around 7.30 am (in fact the bus to Gangajalghati left an half hour ago) and from Bankura another bus to Saltora (Rs 20/-). From Saltora we took a trekker (WE SAT ON THE TOP OF THE TREKKER !!) for Rs 9/- to reach Madhukunda. From Madhukunda, which is basically a railway station, we hitch hiked a motorbike to reach Sarbari More. At Sarbari More , we had our lunch at around 2.15 p.m. and again hitch hiked a SUV (Tata Sumo) to go near Garh Panchakot WB Forest department tourist lodge (Puapur) (minimum room rent is Rs 800/-). 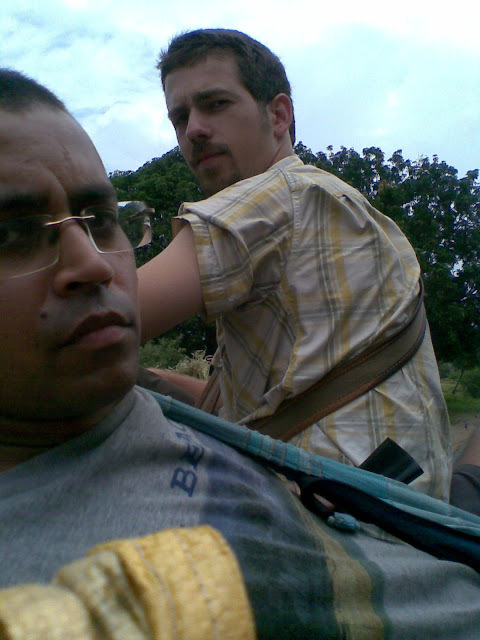 From Puapur we again hitch hiked a bike to reach the lodge. One can meet Lalan (Mobile 9933 66 27 78) to arrange a booking in the hotels (other than WBFD tourist lodge) .He is however not a tourist guide. He helped us a lot. The address of WB Forest Development Corporation Limited, 6 Raja Subodh Mullick Square, 7 Th - Floor, Kolkata - 700013,opposite Hind cinema,beside Wellington. There we met a group of travel enthusiast and went for the tour (hitch hiked) around the Panchet hills. The views are stunning to stay the least. After the tour they dropped us at Sarbari More.Without them we would have been in real soup!! I am really thankful to them (They have an interesting travel blog http://amitdg.blogspot.com/). 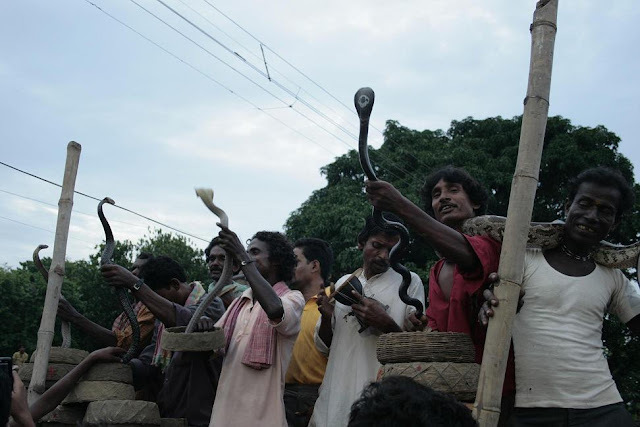 Next day (19/8/09) there was famous snake festival at Bishnupur called Jhapan festival(Worshiping Ma Manasha). It is amazing. 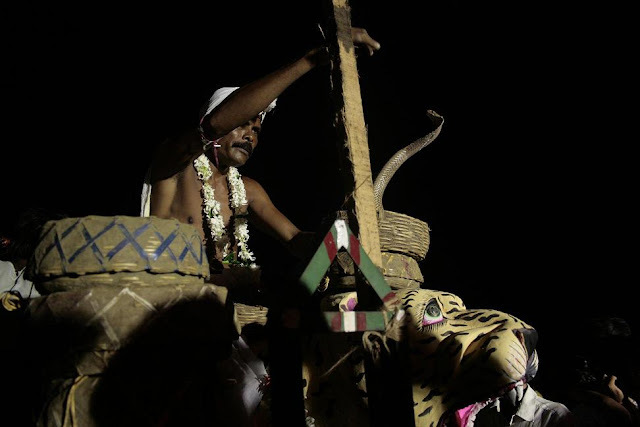 It is held every year on the last day of Shraban. On Monday the famous Jogesh Chandra Pura Kriti Bhavan Museum (or simply "Museum" for locals) is closed . So we could not visit that museum. 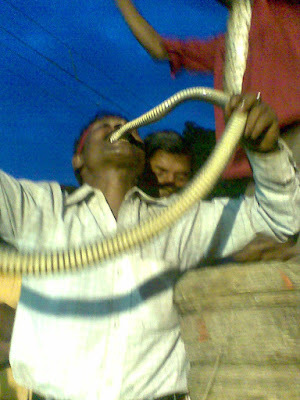 It is 2.5 minutes walking distance from WBTDC tourist lodge You can see snake charmers showing tricks. One of the tricks being mind blowing, snakes biting their tongue!!!!! 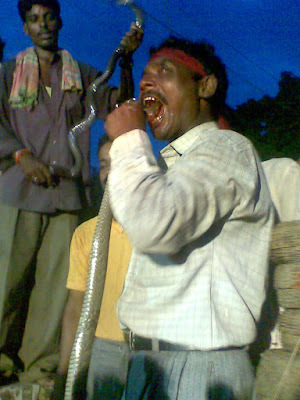 Picture of Sukumar Bauri, eating snakes - he is from Bankura. 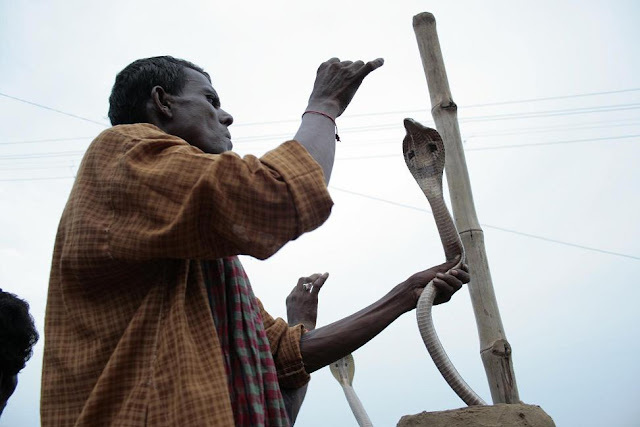 He said within few years time , there won't be any snakes, because there is no toad in the field because of insecticides. The festival ended at 7.30 p.m. Then we left by a rickshaw at around 10 p.m. (please leave by 9.45 pm , otherwise the rickshaws will be few and far between) and reached at Pokabandh (lake) bus stand. From there you can get bus to Kolkata from 10.30 p.m. till 12 pm ( I have been told). It reaches Kolkata within 4 hours . Because of immersion of Ma Manasa the bus was late and came after 11 pm. 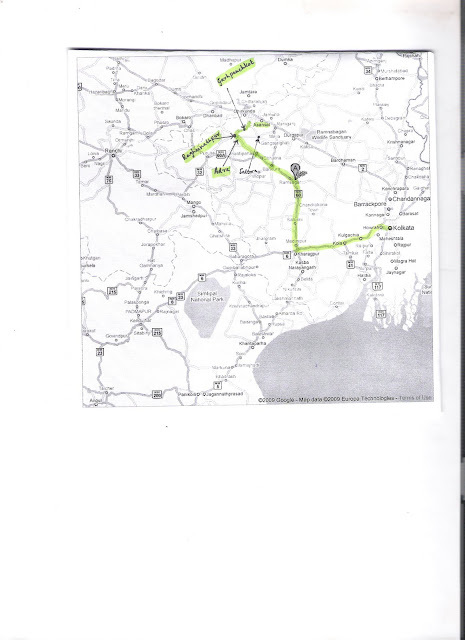 We reached Kolkata at 3.30 a.m. We took this route because Rupasi Bangla train leaves at 5.30 p.m. In that case we would have missed Jhapan. Then there is Chakradharpur express train at 10.30 p.m. , but you won't get to seat, we were told, since it is very crowded. The early morning Rupashi Bangla train at 5.55 am is not very convenient , since I would have been late in the office next day. Quite interesting and informative. 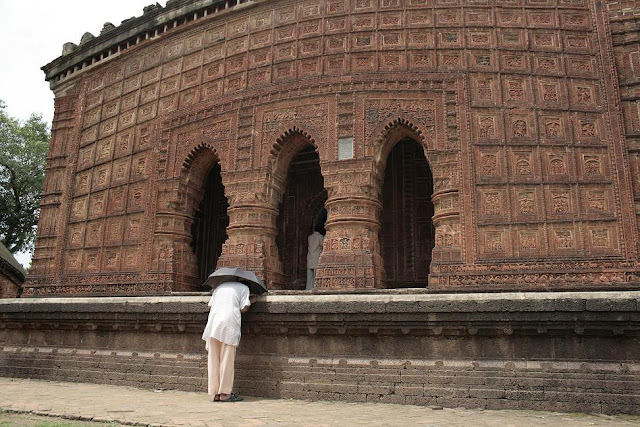 I haven't been to Bishnupur yet. 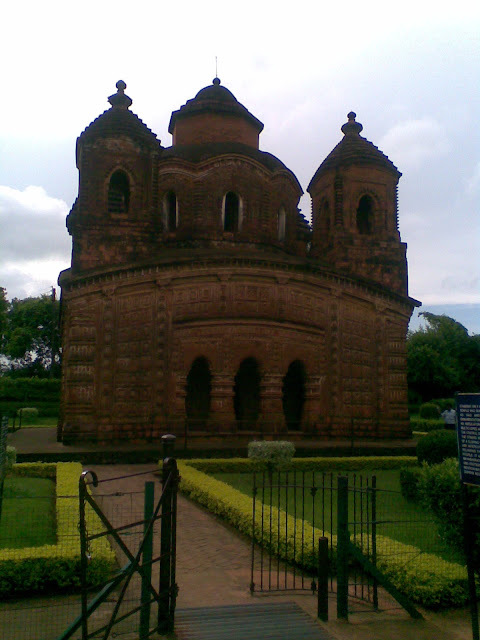 I think your this piece will be of huge help if I plan any tour to Bishnupur this Winter. WOW! I REALLY ENVY YOU!! !